First and foremost, scenic designer Collette Pollard is a storyteller. Most recently, her design for A Streetcar Named Desire, playing at Williamstown Theatre Festival through Sunday, has landed a place in the spotlight because of the announcement that the production would feature onstage seating, a first in the festival’s more than fifty years of operation. The production, helmed by David Cromer (Off-Broadway’s Our Town, Broadway’s The House of Blue Leaves), originated at Writers’ Theatre in Glencoe, IL. 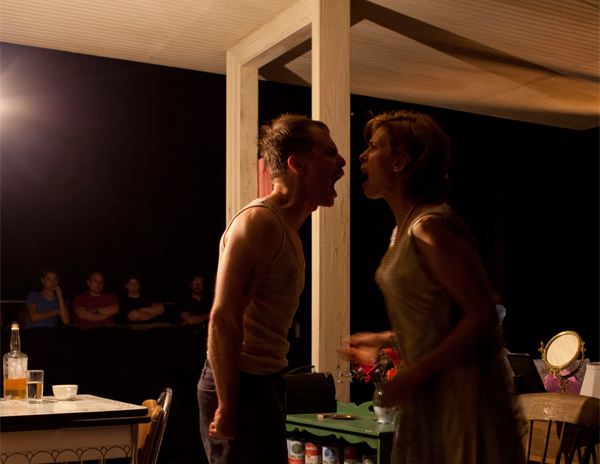 The cast at the time were local actors; at Williamstown, Sam Rockwell and Jessica Hecht are taking on the roles of Stanley Kowalski and Blanche DuBois respectively. Despite the cast’s name actors, however, the thrill of the piece comes in its unique ability to intimately engage an audience by placing them, in some cases, literally mere feet away from the actors. Such is the vision of Ms. Pollard, whose designs for the production are sparse and wholly concerned with facilitating the action of Tennessee Williams’ classic play. In Glencoe, the play was performed in the round. In Williamstown, Pollard explains, “it’s in the Nikos space, which is a traditional proscenium space with a really large apron,” a configuration that, for a previously conceived production, introduced the quandary of replicating a successful design element within new, exciting surroundings. In some ways, Pollard has an eye to previous designs of the play. “I’ve seen different versions of it,” she explains, “where the bathroom is off the kitchen, but having the bathroom in the bedroom,” as in this production, “it’s obvious that Blanche is out of place. We put the street outside the Kowalskis’ house on the side,” Pollard explains, “so there’s some distance between the people sitting onstage and the house on the apron.